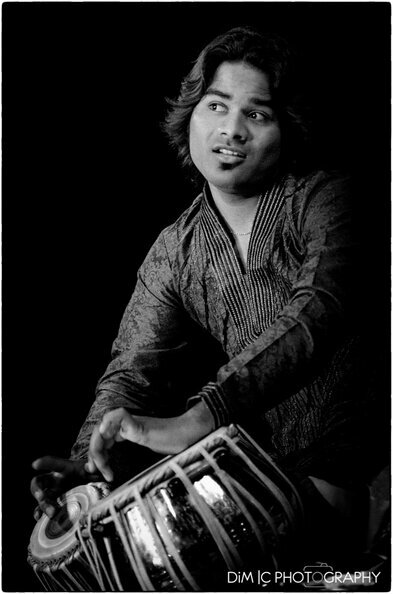 Nishad Ali Kawa, grand son of the great classical singer, Abdul Gafoor Kawa, was born in 1994, in Jaipur, India.He started practicing and learning tabla at the age of 2 with his uncles Ashik Ali (who performed with Pt Vishwa Mohan Bhatt…) and Amjad Ali (who performed with Ustad Sultan Khan, Ustad Raïs Khan, Ustad Gulam Ali…)Thanks to the teachings of his master, the great Ustad Hidayat Khan Sahib, he has developed a great technique and a rare sense of the improvisation with an undeniable virtuosity. In the pure tradition of the Delhi Gharana (the school of Delhi), Nishad Ali develops some rhythms in 10, 12 or 16 times as well as the complexes and rarely played 9,11 or 13 times.Young genius of the drums, he participates, at the age of 3, at the classical contest of the Darshak Sanstha and wins the Bhal Vishiste price. He was noticed very young by some great famous masters, like his future guruji Ustad Hidayat Khan (who accompanied Pt Ravi Shankar, Ustad Vilayat Khan, Pt Bhimsen Joshi, Ustad Gulam Mustapha Khan…), but also by Ustad Fayaz Khan (table), Ustad Sultan Khan (sarong)Then, Nishad used to play all over Rajasthan with his brothers. They performed at the Virasat festival of Jaipur and for the president of India, M. APJ Abdul Kalam.He accompanied also some great classical musicians like Vani jai Ram or Begum Afroz Bano (with no doubts the greatest singer of thumri, still alive today).